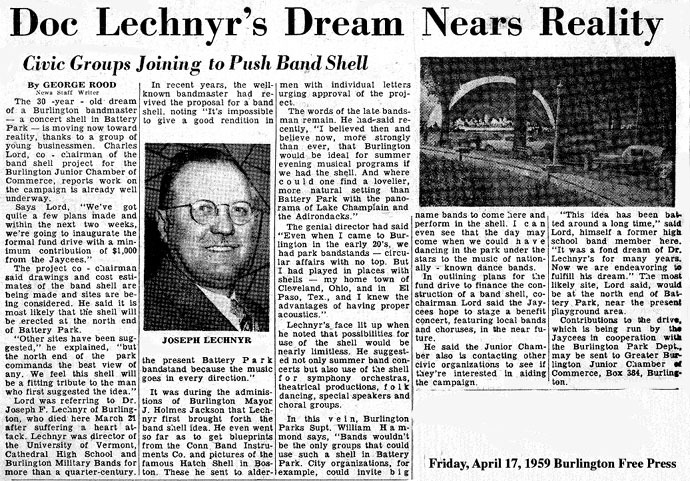 Joseph F. Lechnyr was born in Prague, Czecho-Slovakia in 1896, the son of an Army Band master; in addition, his mother was a pianist and a Soprano. "Joe's" music education started in Prague and continued in Cleveland, Ohio, his adopted, American hometown, in both public and parochial schools. He served in World War I as Band Master of the 3rd Divisions, 76th F.A. Band in 1917. In 1921, Joe moved to Burlington, Vermont where he organized and was first conductor of the Burlington Symphony Orchestra, which office he held until 1934. It was during those same years that Joe started conducting the Burlington Military Band. We were lucky enough to have him for he was greatly in demand. He conducted the U.V.M. and R.O.T.C. bands starting in 1921 and was director of music at St. Michael's College from 1922 to 1925. Joe also directed the Band and Mixed Chorus at Middlebury College from 1924 to 1936 and from 1934 to 1936 he co-conducted the Vermont Symphony Orchestra. In addition to these roles he had been Supervisor of Music at Cathedral High School, and Director of their Band, Glee Clubs and Mixed Chorus. At the same time he was Choir Director at the Cathedral of the Immaculate Conception he produced music of such a calibre that his choirs were called the best in New England and among the top in the U.S. and Canada. As if all this wasn't enough (are you tired yet?) he had also been the Director of the American Legion Drum and Bugle Corps, Burlington Post #2 and Director of the Chittenden County 4-H Band. In his free time (what FREE TIME!) he was Guest Conductor of the U.S. Ground Forces Band, the U.S. Navy Band, U.S. Army Band, U.S. Air Force Band, the Grenadier Guards Band, Montreal and the Irish Guards Band in London, England. He was a member of Knights of Columbus, American Legion, National Catholic Music Educators, National Catholic Bandmasters Association, Vermont Music Educators, New England Music Festival Association, M.E.N.C, College Band Director National Association and the American Bandmaster Association (whew). Oddly enough, the University of Montreal didn't hand him a doctorate for all the work he had already done. 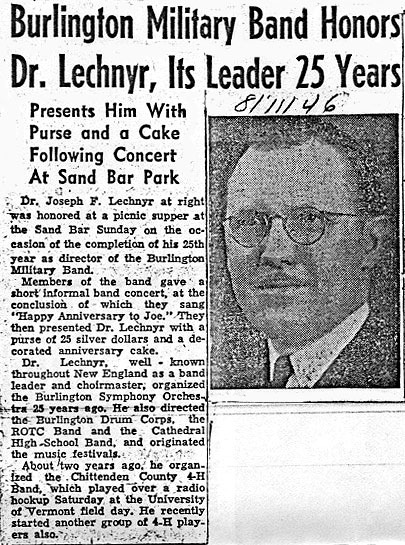 Instead, Lechnyr attended the University of Montreal after receiving his undergraduate degree from the University of Vermont and promplty earned his doctorate in Music dubbing him Dr. Joseph F. Lechnyr in 1943. 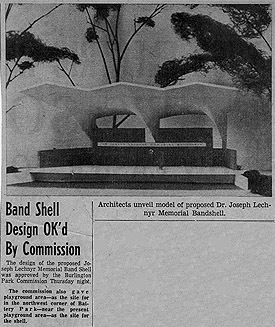 It is due to his great musical contributions to the City of Burlington, State of Vermont, and the United States that the Band shell in the park, which had long been a dream of his, was dedicated to Dr. Joeseph Lechnyr after his death in the mid 1970s. It was a proud moment for his legacy, for the City and for the Burlington Concert Band and his gifts will never be forgotten.